Published: May 4, 2015 at 02:59 p.m. Updated: Oct. 19, 2015 at 05:36 p.m.
Today marks an important day for Star Wars fans; a brand new trailer for the upcoming film will premiere during tonight’s Monday Night Football matchup. To prepare yourself for tonight’s exclusive preview, take a look at the results from the NFL’s supplemental Star Wars mock draft conducted in Galactic City in Coruscent. The lesser-known draft took place earlier this year on May 4th (which is officially Star Wars Day because, you know, May the Fourth be with you). Here’s how each team did. The Bucs had a tough dilemma at the top of the draft and could have gone with either Skywalker. Some felt Luke would have been the safer pick because Vader had some troubling history including (but not limited to) a run-in with some Tusken Raiders and his alleged involvement during an incident at the Jedi Temple. 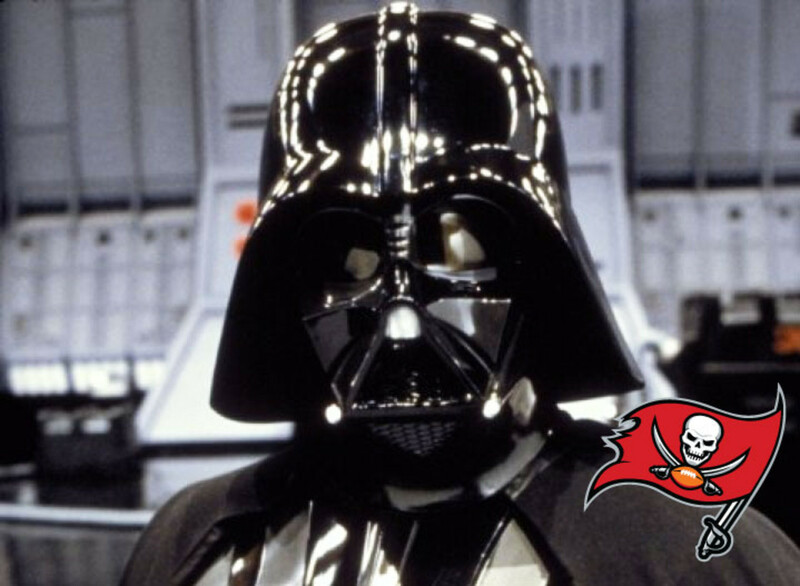 But the Bucs were undaunted and went with Vader here. The Titans had a youngling at quarterback many thought could be their future. But the Titans resisted a number of trade offers (Chip Kelly offered everything include a moisture farm on Tatooine) and went with Skywalker. A quick study, Luke should be able to master quarterbacking in a matter of days, when it takes many QBs years to master the position. The mocks got this one right, as many figured the Jags were going to look to strengthen their pass rush. And many feel the Jags have one of the most sure-thing Wookies in the galaxy. Chewbacca's impressive wingspan alone is going to be a nightmare for quarterbacks, and Andrew Luck is already dreading his trip into Duval County this year. He also could fill a J.J. Watt-type of role as a Red-zone threat, too. The Raiders could use some help at a number of positions but leadership at the top is probably where they could use it the most. And Sidious should provide instant credibility. And rumor has it Sidious already has a plan to solve the team's stadium problems with a proposed dome stadium that would orbit the Earth, and while it would appear to be a moon, it would certainly be no moon we've ever seen. Washington might have got the steal of the draft as Yoda fell to them with the fifth overall selection. He might be one of the oldest prospects in the draft, but nobody can question his heart and his skills. Seriously, pull out the tape from the Clone Wars and Yoda's performance jumps off the screen. The Jets have finally found a charismatic leader the team has lacked since the days of Joe Namath. Some might question his motivations and he was dinged for not being a team player; but he's always been there when he has been counted on the most. Plus, he's got a fast trigger and nobody would be able to shoot first on him. Kenobi was the top Jedi on most lists headed into the draft. Proponents of Kenobi point to the tape from Mustafar when he absolutely dominated Darth Vader. And you should ignore the tape just before the Battle of Yavin because it's misleading in that Kenobi clearly won even though many thought that he lost. The Bears absolutely got a steal here. Many folks will dismiss Maul because nobody wants to go back and rewatch the tape from the Phantom Menace. But if you do, you'll find a guy who is nearly unstoppable one-on-one. The only way you can stop him is with double-teams and double-teams from the best in the business. There is no question Fett is one of the most popular beings in the draft. But he also might be one of the most overrated as well. Fett has the reputation of always getting his man, but in his biggest performance at Cloud City he was given a huge assist from Darth Vader, so be weary. St. Louis devoted its entire NFL draft to offense, and the versatile Hutt could actually play both offensive and defensive tackle this season. But mostly because it would take too much time to get him off the field at the change of possession. Windu offers great leadership for the Vikings' secondary. And let's be honest, he's already rocking a purple light saber so he's looking pretty good. If you look at the film, Windu absolutely dominated Darth Sidious until he was nullified with a cheap shot by Darth Vader. Grievous would be a pretty great tight end. With multiple hands for blocking, he could be a boon in the running game. And those same hands would make him a nearly unstoppable Red-zone target as well. The Saints really want to invest in defense for the coming season and they made a bold move when they selected The Inquisitor rather early. He was menacing and showed some great flashes early on, but he was discarded rather quickly in the end. Still, it's hard to pass on a Pau'an trained by Darth Vader himself. This is an interesting pick. He's got great skills, but he was a bit of a maverick that sometimes refused to listen to his coaches. Some even questioned his instincts because one of his last Padawans ended up turning to the dark side. The 49ers had a bad breakup with former coach Jim Harbaugh. And I'm afraid their latest acquisition is going to point out to them that letting Harbaugh go to Michigan was a trap. High motor and greatly motivated to prove that she belongs, Tano is going to be a huge part of the Texans defense for some quite time. Tano slid down draft boards because her time with the Jedi ended under suspicious circumstances. But history showed Tano was right all along. (SPOILER ALERT) She also survived Order 66 and became a huge part of the revolution. The biggest need for the Chargers, maybe more than anything on the field, is securing an actual brand new field. So the Chargers could use a savvy ambassador who has shown she can get things done. Plus, combine measurables show the force is strong with this one. Sure he might be Corellian, but he seems to have been born to be a member of the Chiefs. He's an unheralded star who is often overlooked by the general public. But he's just as vital to the plot as his more celebrated colleagues. And he's one guy who could actually catch a touchdown pass for the Chiefs, too. Lando is a little shifty; a little underhanded and a guy you're not quite sure you can trust. But if there is one guy who can get the most out of Lando's skills, it is Rex Ryan. Love this move for the Bills. Love it. The Eagles need a lot of help on defense. And while Kelly was reportedly willing to do anything to move up in the draft to get Luke Skywalker, Revan will probably be more beneficial to his team in the long term. The Bengals always seem to find guys who fall through the cracks to excel on defense. And Bossk will continue in that position. Many consider Bossk the most-skilled bounty hunter in the draft, and the extended universe even puts him ahead of the much-celebrated Boba Fett. Porkins would never bail on his teammates. And really, he just looks too much like Ben Roethlisberger for the Steelers not to take him. The Lions need an infusion of young talent on defense, and Rey looks long on potential in limited film we have on her. But this could end up being a steal. Dooku has similar skills to Yoda and Windu, but he's got a big-time mean streak that will quickly impact the Panthers defense. The Panthers have gotten a great value here. This talented pilot has looked very good in limited appearances. She is the kind of pilot who can eventually lead the Cardinals once Carson Palmer retires. Once again, the Ravens find a way to find stars at the end of the first round. Sure, R2-D2 might be dinged because of limited mobility. But he's a true star with off-the-chart smarts that will end up being a big-time player for the Ravens for years to come. He's a little reckless and there are questions about his character. But the Cowboys know they are getting somebody who can contribute right away. Tell me if you've heard this one before. The Broncos go after a Jedi who once thought his career was finished? The Colts could use an upgrade on defense. Wicket might be undersized on paper, but his heart is unmatched. He will quickly become one of the most popular Colts because he plays his best in the big games. A typical Packers pick. He might be somewhat anonymous to the casual fan, but he's no doubt the kind of role player who will have great success with the Packers. He was overshadowed by teammates Kenobi and Anakin Skywalker, but there are some who believe he was the best of three. One of those who believe that is Pete Carroll who knows he got a great value. Perfect Patriots pick. They need some youth on the team and with Bridger, they have a young Padawan who has shown he can summon the dark side when needed.